LONDON--(BUSINESS WIRE)--Technavio’s latest report on the global marine wind sensor market provides an analysis of the most important trends expected to impact the market outlook from 2017-2021. Technavio defines an emerging trend as a factor that has the potential to significantly impact the market and contribute to its growth or decline. In ROW, countries like Canada, Brazil, and Australia have long coastlines. Thus, water-based recreational activities are popular in these countries. In Canada, the growth in the economy and the low unemployment rate has led to an increase in household spending, resulting in the sales growth of the powerboats, eventually leading to a higher demand for wind sensors. There has been a growing trend where ultrasonic wind sensors are replacing cup or vane wind sensors in powerboats. Ultrasonic wind sensors measure the speed of wind using high-frequency sound waves, even above the range a human ear can hear. The ultrasonic wind sensor is a low-cost alternative to the conventional vane and cup or propeller wind sensors. “An ultrasonic wind sensor has two pairs of sound transmitters and receivers, which are mounted at right angles to each another. Each transmitter constantly emits high-frequency sound waves to its individual receiver,” according to Praveen. The technologies used in the manufacturing of marine powerboats are constantly evolving to accommodate the growing stringency of carbon emission and safety norms. OEMs develop advanced automotive technologies that can provide fuel economy benefits as well as advanced safety features. Some of the advanced technologies used are two-stroke indirect fuel injection, four-stroke fuel injection, four-stroke throttle body fuel injection, and electronic control modules. Taking out the ancillary system from the powerboats is the main motive behind the electrification. Electrification helps optimize the marine engines. More improvements are expected in the future as an increasing number of mechanical systems will be converted to computer-controlled components. There has been a growing popularity of the pontoon boats, and the same trend will continue during the forecast period. Several factors are driving the popularity of pontoon boats such as versatility, value, capacity, handling improvements, and superior performance. Pontoon boats have witnessed a demographic shift too. Earlier, it was considered a tired boat for the geriatric population, but with changes in design (attractive and youthful design) and features, its popularity grew among the youth too. Become a Technavio Insights member and access all three of these reports for a fraction of their original cost. As a Technavio Insights member, you will have immediate access to new reports as they’re published in addition to all 6,000+ existing reports covering segments like automotive components, wheels and tires, and powertrain. This subscription nets you thousands in savings, while staying connected to Technavio’s constant transforming research library, helping you make informed business decisions more efficiently. 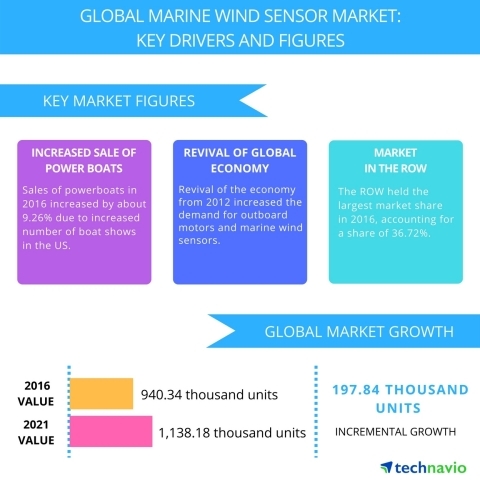 Technavio’s latest report on the global marine wind sensor market provides an analysis of the most important trends expected to impact the market outlook from 2017-2021.